What are Geeky Goody Baskets? I’m so glad you asked! No really! 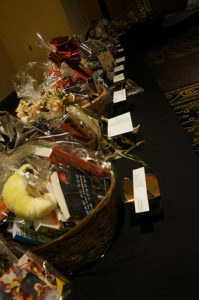 Each year we assemble 15-20+ themed baskets filled with items donated by our amazing celebrity friends and sponsors. These baskets are literally hundreds of dollars worth of awesome. On the night of the Geek Gala, we raffle these fabulous goldmines off for the crazy low price of only $1 per ticket! It’s true! All the raffle ticket sale proceeds go to our chosen Gala charity, which this year is The Dave Thomas Foundation for Adoption (DTFA) in memory of our founder’s little sister, Christina, a former foster child who passed away in 2005. We are pleased to announce that last year we were able to donate $2,000 to DTFA – thanks so much for your contributions! Make sure to follow us on Instagram for sneak peeks of the donations! **This year, we have a brand new “basket” option. Rather than vying for 1 chance to win – you will now have 15 chances to win! We have assembled 15 awesome items that are valued between $50 – $250 in value. If your ticket is chosen, you will be able to choose a number between 1-15 and win the prize that is revealed.